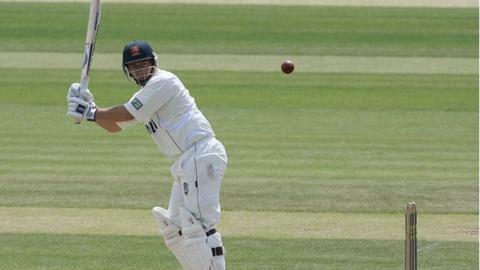 Essex all-rounder Graham Napier has equalled the record for the number of sixes in a first-class innings. Napier, 31, cleared the ropes 16 times on the way to a 130-ball 196 as Essex, 318-6 overnight, were all out for 548.He matched the number of maximums hit by Andrew Symonds for Gloucestershire against Glamorgan in 1995. Surrey captain Rory Hamilton-Brown hit an unbeaten 148, and Kevin Pietersen 58, as they closed on 277-4 in reply. All-rounder Napier, who also holds the record for sixes in a Twenty20 innings, was last man out for Essex after also sharing a ninth-wicket stand of 190 with Chris Wright, who contributed 34. He fell short of claiming the outright record when he skied an attempted pull off Stuart Meaker and was caught by home wicketkeeper Steve Davies. Right-hander Napier is playing in his first first-class game since June 2010 after suffering a double stress fracture to his back last season. Having returned to fitness, his pace bowling claimed a hat-trick in the Clydesdale Bank 40 against Glamorgan earlier this month, repeating the feat he achieved in a second XI fixture against Durham in April. If required to bat again, Napier would need to clear the ropes five more times to break the record for sixes in a first-class match, which was also set by Symonds at Abergavenny in 1995. Napier added 125 to his overnight 25 in the morning session alone and went to both his century and 150 with a six. He was particularly viscious against Gareth Batty, who had seen Chris Tremlett drop Napier at long-on when he was on 118, smashing the off-spinner for seven of his 16 sixes. But Surrey responded well to Napier's onslaught as Hamilton-Brown put on 136 for the first wicket with Tom Maynard - Surrey's first century opening stand in almost two years. It was ended when Maynard edged behind off David Masters, before Mark Ramprakash fell for a 12-ball duck. England batsman Pietersen came in with 25 overs of the day remaining and played fluently for his 56-ball 58, despite enjoying a let-off on 18 when his drive on the up off Masters was dropped by Mark Pettini at mid-off. He eventually fell lbw to occasional medium-pacer Matt Walker. But Pietersen was upstaged by his captain Hamilton-Brown, who brought up his third century for Surrey with this 20th boundary as he ended the day 23 short of his career-best 171 not out. "We know he's capable of that, but when he plays like that he's just in the zone. "He said he felt he could hit every ball for four or six, he's a real entertainer and this ground at Whitgift is certainly not big enough for him. "People will ask why has he not played more recently but he's been injured. "Obviously Naps will get all the headlines and rightly so for his innings, but I thought the way we batted as a group was excellent." "It's been hard, mentally, these past 11 months and there were low points when I wondered if I would get back out on the field again, but you play mind games with yourself in an effort to stay motivated. "Part of that was telling myself I would enjoy every single moment if I did get back out there again. "Things have been coming along nicely and getting back into the first team has been great for me. Every minute out there playing is something for me to savour. Now I want to make the most of any opportunity I get. "I had an idea I was close to the world record for hitting sixes when I saw the figures at lunch time but I wasn't thinking about it too much, I was more conscious about trying to get to a double hundred."